August 14, 2017 is the 70th Independence Day of Pakistan! This is a day to celebrate the amazing beautiful Land of the Pure. Why not plan a party to fuel your patriotism and plant the seeds of love in the hearts of your children? Here are all the details and resources to plan a Pakistan Independence Day Party! Set the theme as Green and White (obviously!). Grab green and white tablecloth, paper plates, napkins and balloons. If you live in Pakistan, it’s easy to get lots of flags, balloons and buntings from the market. If you’re outside of Pakistan, you will need to do some DIY. Not to worry, we have lots of ideas how to make Pakistan Flags and Balloons here. Set a main table with all your decorations. You don’t need to buy new things. Improvise with any and all Pakistan theme items in your house: trucks, paintings, mats etc. Bring them all out and get creative! 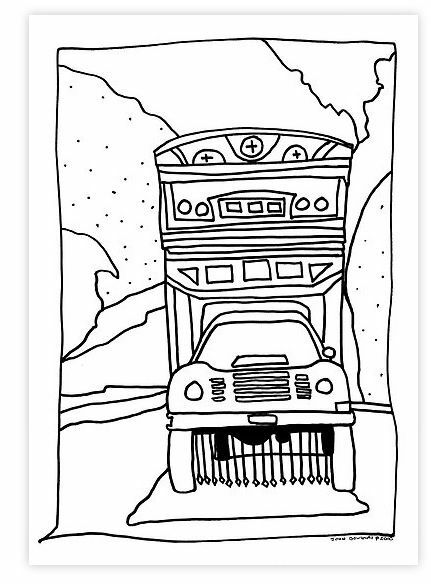 Create your own beautiful truck art through these sheets. Print lots of sheets and provide lots of crayons and coloring pencils. Sing lots of milli naghme. Here are a few of my favorite ones. Play a game of passing the parcel and put a list of popular Pakistani national songs in a box. Pass around the box and pick a song from the box at each turn. Everyone sings together! Have a parade by waving the flags the children made. You can either get someone to play the dhol or put on the some favorite national songs. Play a few games from your childhood like baraf pani, oonch neech, kho kho, pithu garam etc. Here is a wonderful detail of these games on Multicultural Kid Blogs. 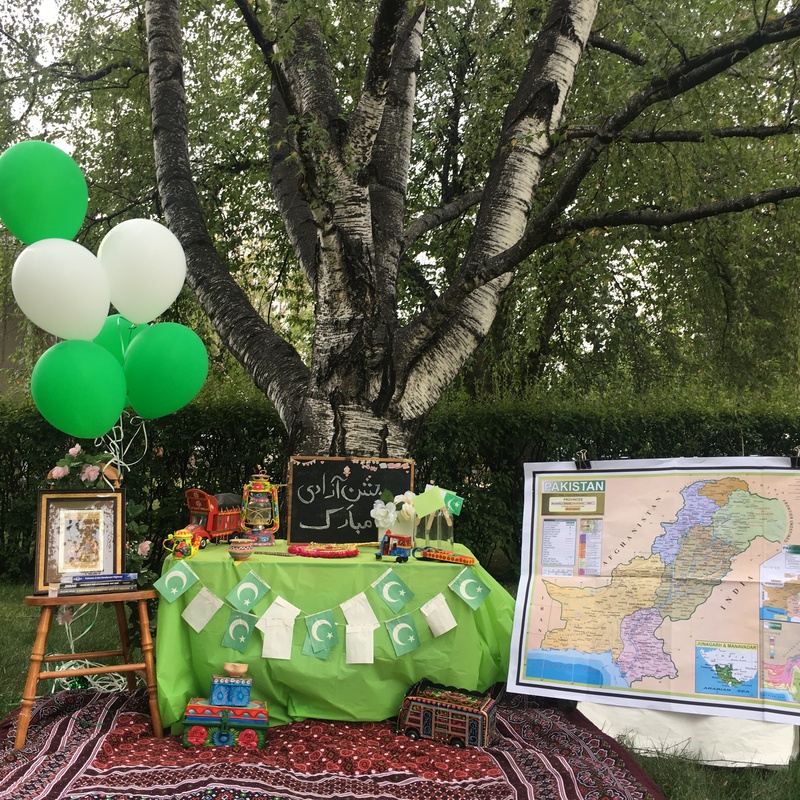 Place the Pakistan map in a prominent place and encourage children to observe it and then have a open ended conversation about the different cities, what they are famous for and the climate. Play a game of who has been to the most cities of Pakistan! Put on some fun music and showcase the dances of all regions of Pakistan. This is a fun way to learn the luddi, Makrani dance and the Kalash dance etc. Set up a story board and let children observe it and then walk them through the pictures. You could set up a history board with the timeline of the making of Pakistan, a cultural one with the regional dresses of Pakistan or a travel one with post cards from Pakistan. Set up a face painting station and get a volunteer to paint Pakistani flags on faces. This is a great way to generate hype and excitement for the Pakistan Independence Day Party beforehand. Every family gets to present a talent related to Pakistan. This could be a song, a drawing, a book they read and would like to share, an outfit they picked for Pakistan Independence Day etc or a story. Keep it simple and involve the children. Every family gets 2-3 minutes. Make sure you tell your guests before hand so that they come prepared! What’s a desi party without some great food? Choose your menu based on the time of the day. There are so many great options for Pakistani food like Biryani, Chicken Kerhai, Chicken Tikka, Nihari etc. You could also keep it simple and give Pakistan theme to popular snacks such as Star and Crescent Sandwiches, Star shaped Kebabs, etc. Even popping a Pakistan flag in a regular dish (like my friend did below) gives the table a festive Pakistan Independence Day theme. Set the mood of the party through some great patriotic music. Some ideas here. Ask everyone to wear green and white! Keep goodie bags for the kids to take home as party favors! Hope you enjoyed this post of how to plan a Pakistan Independence Day Party! Jashne Azadi Mubarik! Wishing you all a very happy Independence Day! You can use these same ideas for a Pakistan Day party on March 23 also! Next Post Teri Raza Review: What do you think of this Pakistani Drama? Thanks for your comment! We love your craft ideas! Jashane Azadi Mubarik! Thanks for sharing such a nice article on the occasion of Independence Day. This day remind us the sacrifies, devotion, love, humanity and unity which is the great effort of our National Hero “Quaid-e-Azam”. Keep up the good work going on. Thanks!